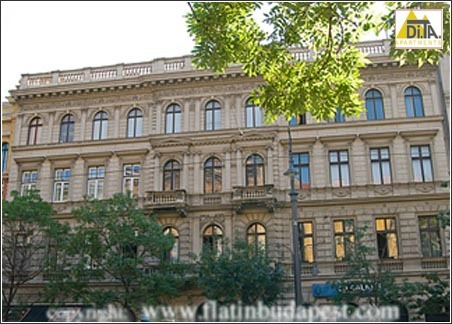 The apartment is located in the PEST side of the city (district 5), in the Muzeum Korut (the name of the street), a few meters from the famous National Museum and in the immediate proximity of the pedestrian island Vaci Utca. From the apartment you can easily reach every part of the city, thanks to the near underground stop ASTORIA (red line) and FERENCIEK TERE stop (blue line), both 200 meters far. The apartment can accommodate up to 4+1 people. The apartment is very pleasant and coloured, completely furnished with elegant and nice touch. It is proper for every kind of stays: long and short permanence. Located inside an historical building really close to the National Museum, the apartment is on the 2nd floor and has two balconies that lean out on the road. The 100 smq apartment is very bright and airy. It is composed by 2 rooms, a kitchen and a bathroom. It has 5 bed places: 1 King bed size (divisible in two individuals bed if necessary) in the first room, 3 sofa-armchairs in the second room that can be used also like a livingroom. The apartment has been recently restructured.